Cars that automatically comply with speed limits are set to become a reality and black box data recorders will legally ensure you don’t disable the speed control system. Many of you out there will have already experienced being told by your car to reduce your speed as the GPS SatNav electronics pick up a warning that your car is entering a restricted speed limit zone. But forget the technology involved for a moment, more on that later. What about some of the fundamentally pragmatic issues that could make automatic vehicle speed control a complicated can of worms to open? For example. Not all cars on the roads would have this function simultaneously. New cars certainly would but all older vehicles would not. And you can imagine the road rage when boy racer with his baseball cap turned backwards driving his 15 year-old Beema gets stuck behind a car automatically complying with speed limits. What about the insurance companies who love to load the prices policies when it comes to getting the likes of a Porsche Carrera 4s insured? As all new cars could conceivably have ISA (Intelligent Speed Adaption) built into them it wouldn’t matter if it was a Nissan Micra driven by the local vicar or a Lamborghini Gallardo driven by a Lewis Hamilton wannabe, they would both be going at the same speed; whether it was past the local school or on the motorway. How would insurance companies deal with that? And before getting onto the positives and how technically such a system could work there is a further negative which could have disastrous consequences. We’ve all seen drivers who continue to hurtle themselves down the motorway despite dangerous driving conditions like torrential rain, ice and fog. Here in the UK the speed limit of 70mph applies on such roads but would idiot drivers in their ISA vehicles still allow the car to go at the legal limit even though driving conditions tell any sane human that 40mph would be a lot safer? So those are negatives but lets just take a quick look at some positive facts when it comes to curbing the speed of those kamikaze drivers. International research has confirmed that in urban conurbations the number of road accidents causing casualties is doubled for each 5 km/h a car is moving over the limit. It is estimated that about 10% of casualties could be prevented if drivers who regularly speed at up to 10 km/h would obey the speed limits. And 20% of casualties could be avoided if all vehicles complied with the speed limits. 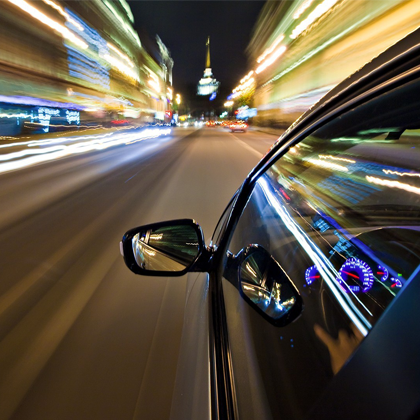 It’s fair to say that speeding only slightly over the limit makes up a large proportion of preventable road injuries. However, it’s difficult to control speeding that is only marginally over the limit but ISA would deal with this effectively. But its not only breaking the speed limits that causes road injuries. Surprisingly, studies have found that drivers travelling at speeds too far below the limits are also more liable to cause accidents, although some of them happen because frustrated Beema man gets impatient and opts for a dangerous overtaking manoeuvre. OK, so speed does kill. We know that. So how would ISA work? Fundamentally there are two levels of systems. Passive would issue a warning to the driver that he is approaching a speed limit zone and advise him to slow down. This of course means the choice is left up to the driver. Then there is the active system where the vehicle automatically adopts the correct speed limit. If the car was already driving at below the speed limit in both those scenarios then ISA would remain dormant. There are a number of different technologies that could be used by ISA systems. Let’s take a look at them. These would operate by sending data to a receiver in the vehicles to activate the in-car ISA system Such information would include speed limits on all road and in special locations like schools or roadwork. Radio beacons could also be used for dangerous weather conditions. In that particular application they could be mobile beacons for use in various countrywide locations. But there are some problems with beacons. Firstly there would have to be millions to adequately cover a country and secondly vehicles have to be in close range of them to pick up the signal. Probably not the most suitable technical title when it comes to saving lives on the road but dead reckoning technology can now be found in more expensive cars as a way of overcoming some of the failings of GPS technology. Quite simply, we have all experienced some of those when our GPS SatNav suddenly dies because we are in car park buildings or heavily wooded areas. to integrate the data with the normally accurate but sometimes unavailable position information from the GPS SatNav system. This combined information means the vehicle’s positional information is consistently accurate. Finally there is GPS. All of us are pretty familiar with this system that determines latitude and longitude of our location on the Earth by calculating the difference in the time it takes for signals sent from usually four satellites to reach our car at that location. So there is plenty of technology out there that can control the speed of our cars. In fact speed-limiting technology was first developed over a hundred years ago and back then was referred to as speed governors. Back then there was no legal requirement for manufacturers and drivers to use them. These days cars like the latest Ford Focus does have ISA installed but drivers can disable it and usually do. However, a new ruling by the European Parliament could result in the mandatory installation of ISA in all new cars within three years and would also legislate that drivers had to use it. How would that be enforced? Simple, by those black-box data recorders just like the ones used on aircraft. And it wouldn’t be a massive technical problem to link those black boxes to authorities and automatically alert them to issue a speeding ticket! Think I’ll cancel my order for that Ferrari California. Paul Whytock is European Editor for Electropages. He has reported extensively on the electronics industry in Europe, the United States and the Far East for over twenty years. Prior to entering journalism he worked as a design engineer with Ford Motor Company at locations in England, Germany, Holland and Belgium.